Dr. Dae wants to continue to share healthy eating and healthy living tips for your family! By sharing your email you will gain access to more Dr. Dae's Videos, articles and classes about simple ways to create health in your family! Thank you for attending my Jack and Jill Southern Cluster Seminar on What’s for Dinner! It has been my honor to help families learn how to create healthy eating and healthy living habits for the last 15 years. It now my honor to support you and your family! What you will find on this page is a summary of some of the most important points from my talk. You will also find a few bonuses along the way. At the end of the page you will find tools to help you create the healthy eating for your families. Thank you for joining for this wonderful life changing experience my changing the way you view What’s for Dinner! What you will notice is that the American family is eating a lot of processed foods and not many fruits and vegetables. These eating habits which is typical of an American family is creating a generation that sicker than their parents and has a shorter life expectancy than their parents for the first time in history – World Health Organization. If there is one thing that I would love for you to take away from this presentation it is that you and your family need to Eat More Plants! If you intentionally start to increase your serving sizes of just fruits and vegetables you will be providing your family with more energy and nutrition that creates better health!!!! 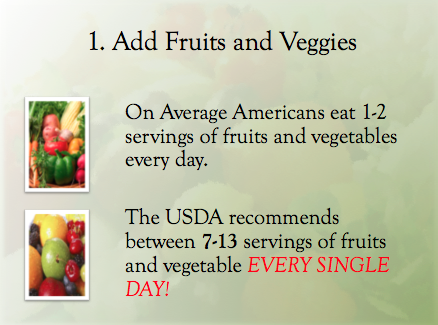 Here is a short video explaining serving sizes of fruits and vegetables. For more videos you can go to my Youtube Channel. Planning is the key to success in every area of your life. Healthy eating is no exception. I’ve learned that a few minutes of meal planning every week can completely transform getting food on the table into healthy and tasty eating in a flash. Click here to read Dr. Dae'sarticle about Meal Planning. While you are in the grocery store put only healthy options in your cart for dinner and for snacks. Here is a clip from Dr. Dae's YouTube Chanel about healthy snacks. Always put vegetables or something plant-based on your plate! If your child is not eating it put it there anyway. It gets them use to the smell, and look of new foods on their plate. The more they see it the more likely they are to try it, especially if they helped to grow it or cook it. (Parents as a side note you have to put it on your plate too and you have to try it also) Kids do what you do if you make the gas face at vegetables why are you surprised when your kid doesn't want to eat it. I can’t tell you how many times I have done cooking demos and the kids were more willing to try it than the adults. Here is a video giving you ideas for healthy snacks for your kids! What I always recommend is preparing a different dish altogether. Let's look at the previous example you need to eliminate dairy, milk specifically. Instead of switching out milk for almond milk. I'd suggest you make an almond milk smoothie for breakfast by adding blueberries, bananas, almond milk almond butter. Now you are still introducing almond milk in a completely different way and it's not being compared to regular milk. You are also rattling more plants! That too complicated try milking cinnamon hot chocolate with almond milk that can work too! By introducing a substitute in a new way you are creating variety and new recipes at the same time. Getting your kids engaged in the kitchen can make healthy eating a fun activity for the whole family. I have been able to work with students during the summer programs to help the broaden their culinary experience. This is something your chapter might be doing or want to do with the children at some of their meetings too. Dr. Dae's Tools to Help Families Change What's For Dinner! Testimonials from parents and families. As my 6 year old eats dinner and commenting on how good the yellow lentils are he says: "of course this is a Dr. Dae recipe. Her recipes are always good - and healthy!" As an editor, my job is to read all sorts of written materials whether I’m interested in them or not. 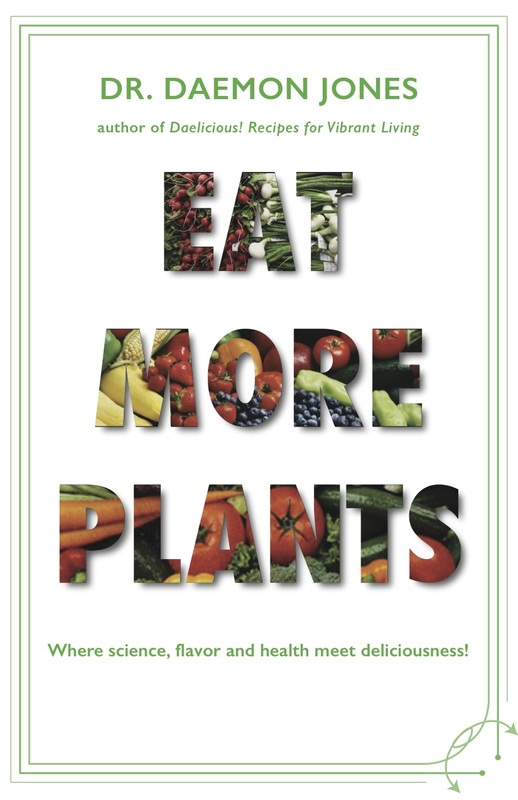 My experience with Dr. Dae’s Eat More Plants was certainly not the norm. I was immediately engaged and educated. Prior to reading this book, I believed I was following a pretty healthy diet to maintain my health, but the concept of viewing food as medicine to heal the body completely captivated me. I found myself sharing the insights I gained with friends and family. Each recipe contains an anecdote that explains the healing properties of the ingredients, which gives you the option to choose the recipe based on its health benefits. Before I was finished editing the book, my thoughts about food had radically changed. As a result, my family and I made the choice to follow a vegan diet. As a family, we’ve thoroughly enjoyed cooking our way through the book’s simple, tasty, and satisfying recipes. It’s so cleverly written that your focus remains on what you stand to gain by eating a plant-based diet, not so on much on the foods you’re giving up. Thank you Dr. Dae for teaching us how to sustain the health of our bodies in the most delicious way! 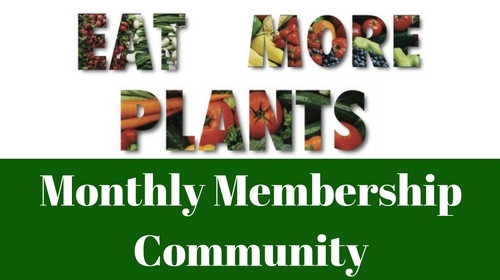 This monthly membership program is designed to help you achieve optimal health by making cooking healthy, fun, and delicious each week—even if you don’t know the first thing about cooking or have much time to learn! Eating healthy doesn’t mean eating raw vegetables, drinking liquid diets, or eliminating your favorite foods. With this program, you learn to create quick and healthy meals that are delicious, vitamin-rich, and nutritious right in your own kitchen! This effortless membership allows you make healthy eating fun, delicious and new every week. Each week, you will discover how to prepare nutritious, vitamin-rich meals right in your own kitchen…even if you don’t know the first thing about cooking and don’t have time to learn.